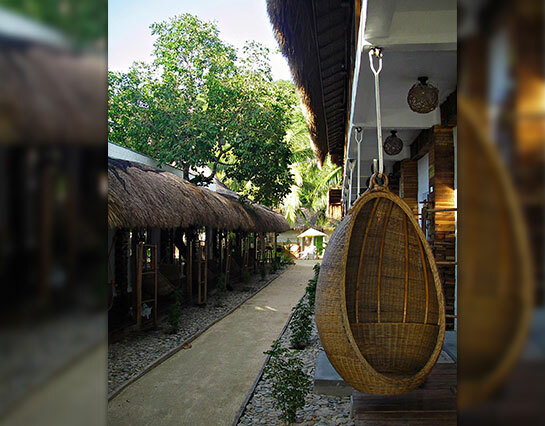 Located in the budding Pops District in Barangay Corong Corong, Eco Hotel El Nido is over a kilometer away from the congested town proper and faces the breathtaking scenery of Corong Corong Bay. The hotel is built green, from the ground up. It features a sustainable design, and our staff applies waste reduction practices whenever and wherever possible, with a reduce, reuse, recycle program integrated throughout the hotel. 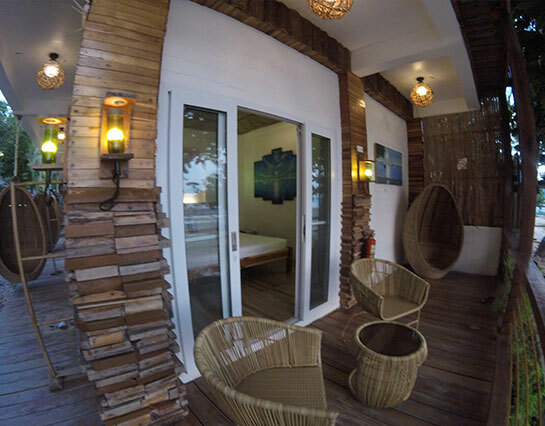 It is a rustic, eco green hotel in El Nido with rooms showcasing native crafts, home-made bricks, felled tree furnishings, upcycled resources and repurposed materials. 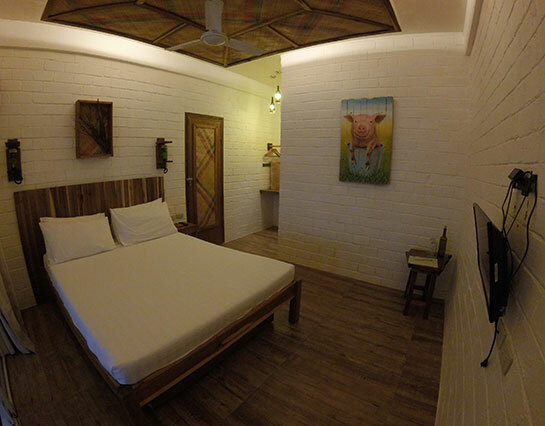 Rooms are powered by solar energy utilized through shower water heaters, desk fans and emergency lights while lighting fixtures are fitted with energy saving bulbs. 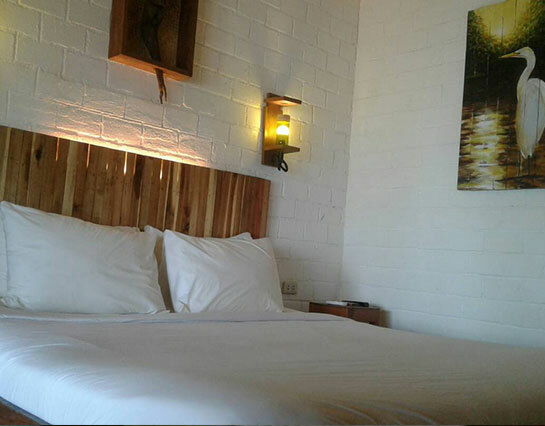 All rooms come with firm mattresses, fluffy pillows, high thread count linens and absorbent towels. 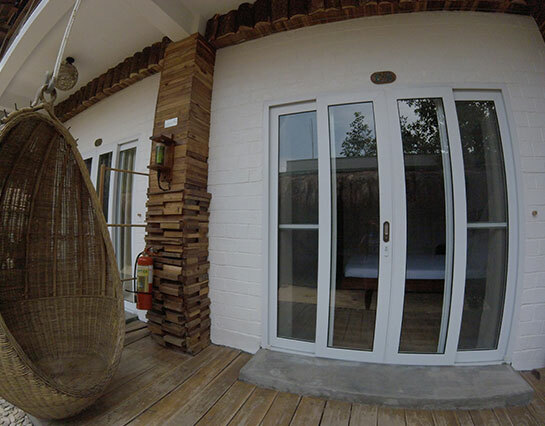 A sturdy, hand woven hammock hangs at every room’s deck and a yoga mat is available at your disposal. 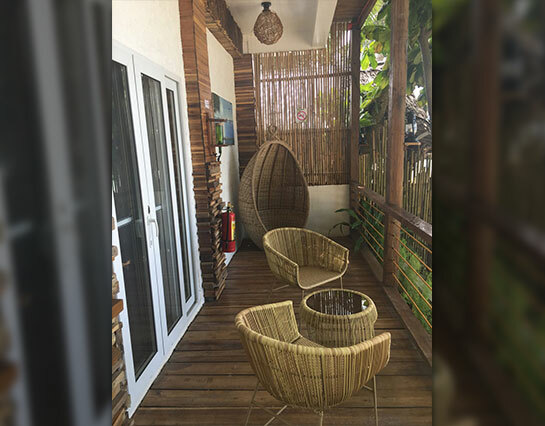 Eco-friendly not only in design but also in practice, our budget-friendly hotel in El Nido, Palawan has readily available essential bath amenities, while hygiene kits are provided only upon request. This is to minimize the unnecessary consumption of resources that usually end up in trash bins after one use.While we uphold eco-friendly practices, guests can do their part by using only what they need; we also recommend turning off the lights and air conditioning units when not needed, as well as conserving water by turning off taps. The common areas are just as well designed to service guests’ needs. 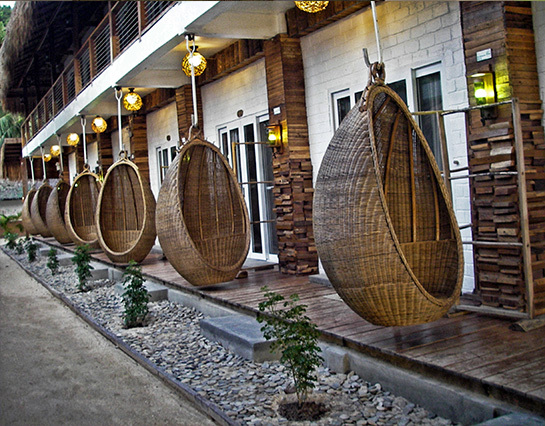 A foot wash is found by the pathway to the beach, hanging racks are provided for soaked garments, shoe racks for dirty footwear and sun loungers for basking. Breakfast is served from 7am to 10am at the lounge bar located next to the Front Desk. Local meal selections plated in melted wine bottles are accompanied by the signature – locally sourced coffee (www.projectlocoph.com). Canned beverages and filtered water are also served. 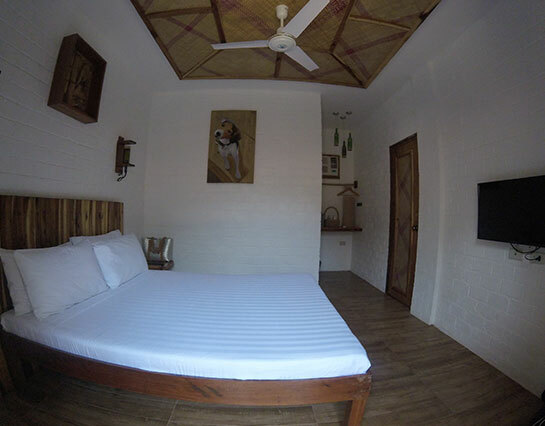 We are a pet-friendly affordable accommodation in El Nido and welcome furry pets up to 25 pounds, subject to a pet fee of P500 per pet per night. Front office hours are from 6am to 11pm. A night duty personnel ushers guests in after FO hours. El Nido is famous for the pristine beaches of the surrounding islands. For the active adventurer, inter-island kayaking may be a fulfilling option. For those who simply want to chill and take all of the beauty in, island tour options with packed meals may be easily arranged. Our Front Desk staff will be more than happy to assist. 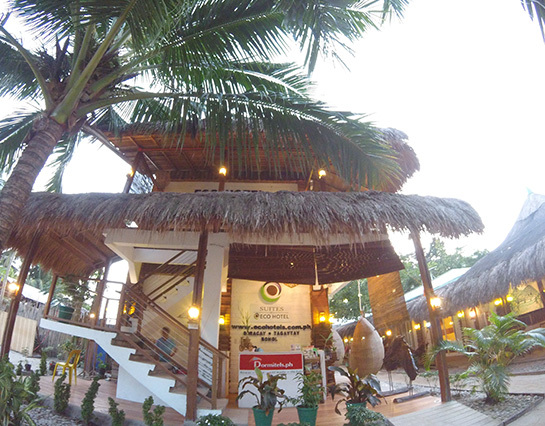 Book a room at Eco Hotel El Nido, today. 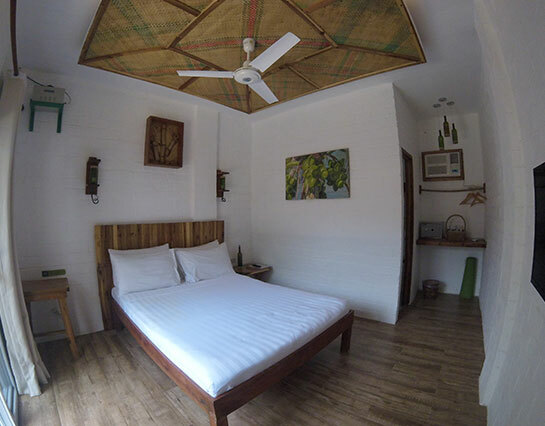 Eco chic, amply spaced and functionally configured, rooms open to natural sunlight through sliding doors draped in blackout curtains intended for privacy. 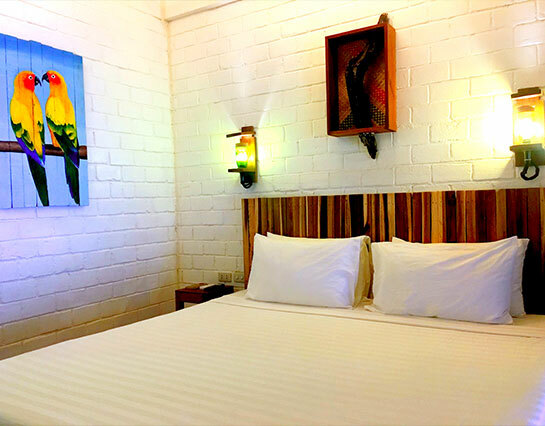 Rooms are adorned with light fixtures upcycled from wine bottles, side tables made from felled tree trunks, headboards assembled using reclaimed wood, handicrafts indigenous to Palawan, home-made bricks, and natural stones sourced from local dwellers. 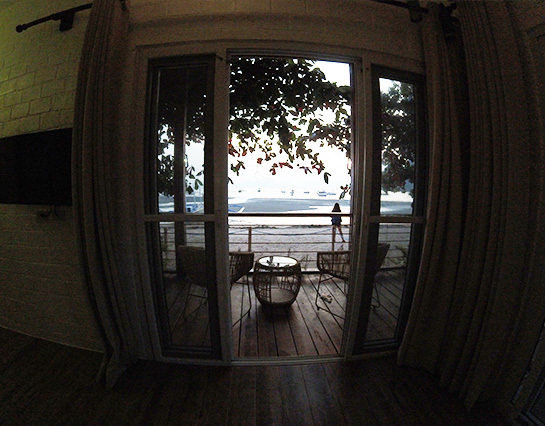 Book this room and behold at each end of the day, a magical change of hues unfolds as the sun dramatically sets to close the day. The island of El Nido is experiencing unscheduled power fluctuations for indefinite periods. We advise that all devices be unplugged to prevent from any kind of damage. The hotel will not be held responsible for any such occurrence. 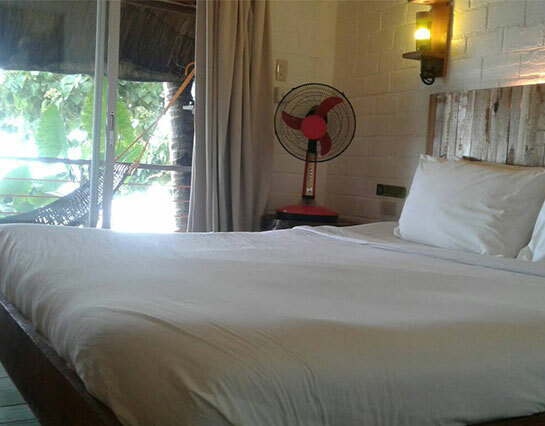 We advise guests to secure enough CASH when traveling to El Nido as cash machines are sparse and credit card terminals are RARELY available. It is best to pay accommodations in advance through available payment facilities. The whole island is Wifi challenged. Be prepared to be disconnected from the virtual world while in Paradise. Various exotic insects breed in tropical weather. It is advised to include insect repellant sprays or lotions in your packing list. Keep rooms closed at all times to prevent them from inhabiting your space.